The Diva Challenge time is around again...wow the weeks are flying by. Mary Kissel has designed this quirky, light and breezy tangle called Birds on a Wire. Thanks Mary and Laura. ﻿The Scottsdale Art Gallery Café is holding their latest exhibition Gestalt 13. What lusciously gorgeous tiles! Birds on a wire was a pattern made for you! Beautiful ART with "Birds on a wire"
Fun, fun, fun. Love your take on the challenge! Both tiles are gorgeous! I like the combinations and the light effect. Beautiful! Both of your interpretations are wonderful. Can't pick a fav. Congrats on your demo in Scottsdale. Wish I could be there. 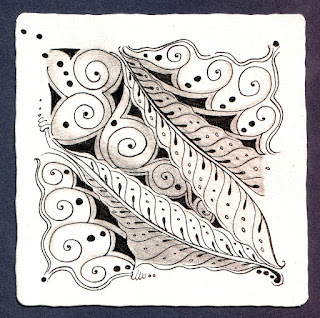 I love these tiles Michele! Your pieces always make me feel like you are having such fun! Beautiful "Birds on a Wire"! Love them both. The colour enhancement on the first one is wonderful! 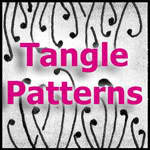 Wow, You did a great job with this tangle pattern. I love your first one, can't get my eyes of it. The middle part is great. 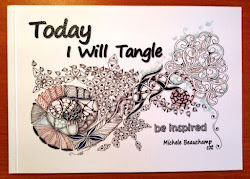 And I love how you did the tangle in second one. Very creative. Love both your tiles. Your shading is awesome! When I went to your blog I was expecting a lot and ..... no disappointment here. Beautiful Michelle! 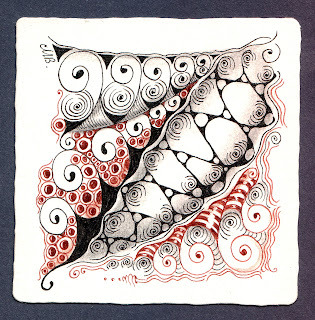 You really took this tangle to a new level. Like the circular parts in the first and your touch of color. Adds so much but does not take over the piece. The second just looks so delicate and your shading gives it such a great 3-D perspective. Both of these tiles are gorgeous! !